As Indonesians, we look good in their traditional clothes and textiles. However, we are way too busy trying to copy what we see in MTV. 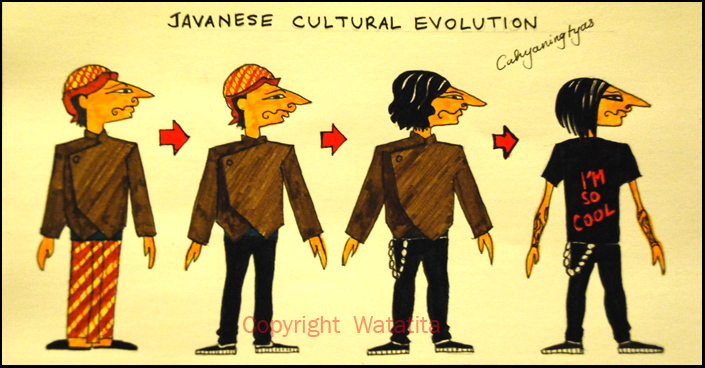 As time goes by, Indonesians view their traditional clothes as “so yesterday”, “old”, as if it should be left behind. 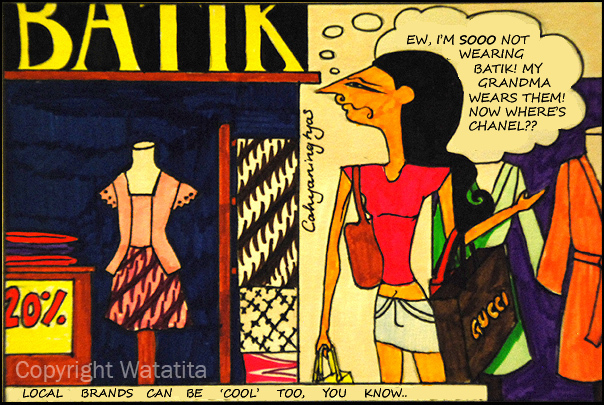 Then, when another country says that ‘batik’ is actually traditionally theirs, Indonesians got really angry. Well, where were you people?? It is incredibly irritating to see Indonesians dressed in emo clothing. I’m sorry but I just had to say it. They look really ridiculous. I used to see them walking around in malls, with their eyeliners and skinny jeans. We were made as Indonesians, wear our traditional clothes and textiles, they were created for us! Our ethnicities, our skin colours, they suit us. A long time ago, traditional textiles were worn every day, so we should be able to wear that now too. When I lived in Australia, I saw African women in their traditional clothing, and Indian women in their saris (much prettier than when they wear miniskirts and tank tops)… and I thought to myself, wow they look beautiful! They look beautiful because those clothes are meant to be worn by them. Why can’t we Indonesians do that too? From that moment I started to believe that we would look better, more beautiful and attractive, if we just…. be ourselves. Be proud of your ethnicity. Wear your traditional clothes… because it just… suitable.